Spending on Health and Education at home and overseas came out ‘top of the list’ in the street survey conducted by Pax Christi today as part of the Global Day of Action on Military Spending. On the day when the Stockholm International Peace Research Institute announced that in 2014 Global Military Spending was $1776 billion, groups around the world are speaking up to urge governments to redirect military spending to projects and initiatives to challenge the real security threats to the world. In Euston, London, Pax Christi and the Quakers ran a ballot where people were asked to vote for their ‘priorities’ for spending to make the world a safer place. After spending on health & education the second priority was in tackling climate change, with 81 votes, then international cooperation and development at 61 with military spending coming in last at 14. Later in the day an event was held outside the Ministry of Defence, Whitehall where another ballot was held while those taking part listened to speeches from Bruce Kent, Victoria Brittain, Jeremy Corbyn MP, and others all urging that plans to renew the Trident programme be scrapped based on financial, humanitarian and moral grounds. At £38 billion a year, the UK has the sixth highest military spending in the world. This is before you even take into account all of the extra money from other budgets and departments that is often found at short notice to fund foreign wars and interventions. Despite recent cuts to social welfare budgets, military spending is still far higher in the UK than in a number of much bigger countries, such as Brazil or India. It also represents a far higher percentage of national GDP than any other European country, and almost all NATO members. GDAMS is supported by almost 50 campaign groups and organisations from across the UK; including Campaign Against Arms Trade, Campaign for Nuclear Disarmament, Pax Christi, Quaker Peace and Social Witness, War on Want, Stop The War Coalition, Pax Christi and others. Why are campaigners opposed to high military spending? We are always being told that high military spending is necessary to maintain peace, create jobs and combat terrorism. This myth is promoted by governments and by multinational arms companies who benefit from the global arms trade politically and economically. Military spending prevents the money from being used to tackle much greater challenges; such as relieving poverty, improving health, and protecting the environment. 13 March : Faith leaders across the UK call on nuclear weapons states to join with other states to implement new approaches to eliminate nuclear arsenals. The statement has been developed and co-ordinated by Religions for Peace UK, Pax Christi UK and a range of Churches and other faith groups. 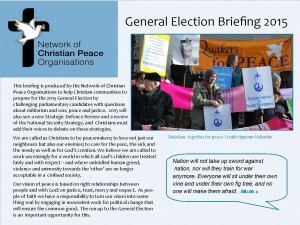 Britain’s involvement in the global arms trade, the Renewal of Trident and Britain’s role in the world are just some of the issues explored in the new General Election Briefing produced by Pax Christi and other Christian Peace Groups. the real threats to security: poverty and climate change. 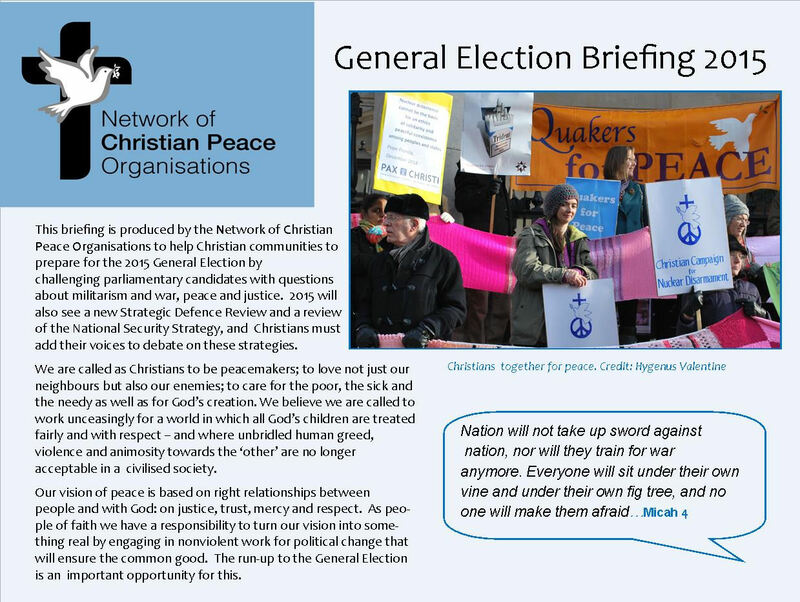 In the weeks ahead thousands of these Briefings will be sent to individuals, chaplaincies, parishes and groups with ideas on how they might set up meetings or interviews with Candidates and engage in debate about Gospel values and a commitment to the common good. It was a 6.30 am start for some members of Pax Christi today as they joined others at the North Gate into AWE Burghfield this morning, to play their part in the all-day blockade of AWE Burghfield. For more than 10 hours two entry gates to Burghfield were closed by protesters and the third was partially closed. Despite a huge police presence there were no arrests – a tribute to the nonviolent nature of the actions. AWE Burghfield is one of two factories involved in the loading of nuclear warheads. Members of Pax Christi, FoR England, the Quakers and the Anglican Pacifist Fellowship came together to offer support and solidarity to the day through prayer and witness. Prayers, readings and songs were shared each hour and included testimonies from those whose lives have been damaged by nuclear testing; reflections from US peace campaigners currently serving prison sentences for their nuclear protests and passages from scripture that urge people to put faith into action and to realise the vision of the prophets of a world where swords will be turned into ploughshares. The gathering was international, with peace groups from France, Finland and Belgium taking part in the full blockade. The whole event was organised by Action AWE a grassroots campaign of nonviolent actions dedicated to halting nuclear weapons production at the Atomic Weapons Establishment factories at Aldermaston and Burghfield.